Irene Justina (Demarais) (MacDonald) Philion passed away peacefully with loving family at her side on Wednesday, February 6, 2019 at the age of 95 years, 11 months, and 19 days. Irene was born February 17, 1923 on the family farm near Gentilly, MN, the daughter of John B. and Justina (Trudeau) Demarais. She was baptized and raised in the Catholic faith. She attended school at St. Joseph’s School in Red Lake Falls, Mount St. Benedict in Crookston, and graduated from St. Joseph’s Academy in Crookston, MN. Following graduation, Irene moved to Seattle, WA to be closer to Melvin MacDonald, the young man she dated in high school, who had been drafted into the US Army and was stationed there. While in Seattle, she worked as a waitress and for Boeing Aircraft. On Thanksgiving Day, November 26, 1942, she was united in marriage to Melvin “Bud” MacDonald in Crookston. She and Bud then returned to Seattle and Fort Townsend where he would finish his military obligation. Following Bud’s military service, they returned to Crookston to make their home. They were blessed with 7 children; Roddy, Kathy, Mike, Kenny, Mary, Dave, and Tom. Irene was a busy homemaker, raised a huge productive garden, and took pride in working hard to raise their family. After their children were grown, she worked for many years as a waitress at the VFW and the Upper Deck restaurant in Crookston. Bud passed away on September 3, 1977. After a couple of years alone, Irene met Lloyd Philion from Red Lake Falls and they were united in marriage on June 12, 1981. They made their home in Red Lake Falls and enjoyed wintering in Texas for many years. Lloyd passed away on January 16, 2009. 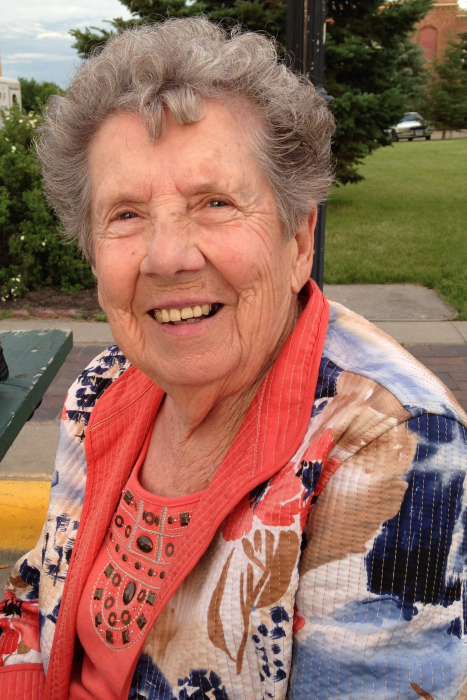 Irene was a member of the American Legion Auxiliary and a member of the Cathedral of the Immaculate Conception parish in Crookston. After moving to Red Lake Falls, she was an active member of St Joseph’s Catholic Church. Irene loved golfing and did so until she was 94 years old; she excelled at playing cards, was an excellent cook, enjoyed dancing, and was always the life of the party. Irene loved her circle of family and hosting huge family gatherings gave her great joy. She took pride in remembering everyone’s birthday. From her children, to their partners, to her grandchildren, to her great-grandchildren – all were remembered and received a birthday card. Irene is survived by children Rod MacDonald of Bemidji MN, Kathy (Curt) Hannah of Baxter, MN, Mike (Karen) MacDonald of Fisher, MN, Ken (Mary) MacDonald of Fertile, MN, David MacDonald (Sandra McNichol) of Crookston, MN, and Tom (Kelli) MacDonald of Bemidji, MN; 16 grandchildren Matt, Tania, and Mark; Troy and Greg; Jason and John; Sam and Andy; Amber and Ben; Ashley, Leigha, and Gareth; Joel and Ryan; and 20 great-grandchildren. Irene was preceded in death by first husband Melvin “Bud” MacDonald, second husband Lloyd Philion, daughter-in-law Beda MacDonald, daughter Mary Buckley, 10 siblings Laura, Lucille, Marie, Virginia, Eva, Delia, John, Alice, Mae, William, and her parents. Blessed be the memory of Irene (MacDonald) Philion.